As a portable storage device, external hard drive plays an important role in backing up files from computer. Because its removable feature could completely prevent the data loss caused by computer lost or crashed. However, it is not without any disadvantage – if you delete a file from external hard drive, the file will be removed directly instead of moved into recycle bin. Because recycle bin is designed for internal hard drive only. What if you carelessly delete valuable photos stored on external hard drive? No worry. You still have chances to recover the pictures from your hard drive. First of all, please prepare the external hard drive where lost photos were stored, a computer to perform the recovery process and a powerful photo recovery program, which is the crux to recover pictures from hard drive. Then how to choose a reliable tool? Jihosoft Photo Recovery deserves a try. 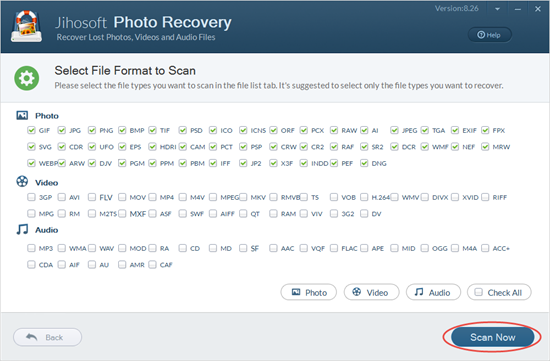 This tool supports to recover various kinds of images, including JPG, TIFF/TIF, PNG, BMP, GIF, PSD, CRW, CR2, NEF, ORF, RAF, SR2, MRW, DCR , WMF, DNG, ERF, RAW and so on, from a wide range of storage devices. 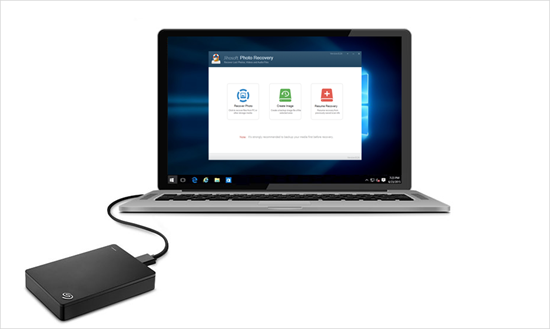 With it, recovering deleted photos from external hard drive is just a piece of cake. Step 1: Connect and select your hard drive. Use a USB cable to plug your hard drive to computer. 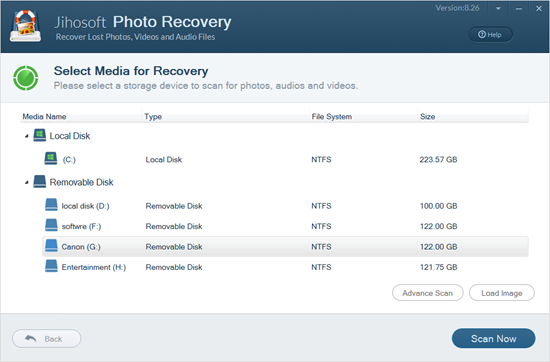 Then launch this Hard Drive Photo Recovery software and tap on “Recover Photo”. Next, select the target hard drive from the drive list. Step 2: Scan and preview deleted photos. Hit “Advanced Scan” in the down right corner, and assign the format of photos you want to recover. Then click “Scan Now” to scan your drive. When this process is completed, the result will be listed out by category for you to preview. Step 3: Recover photos from hard drive. 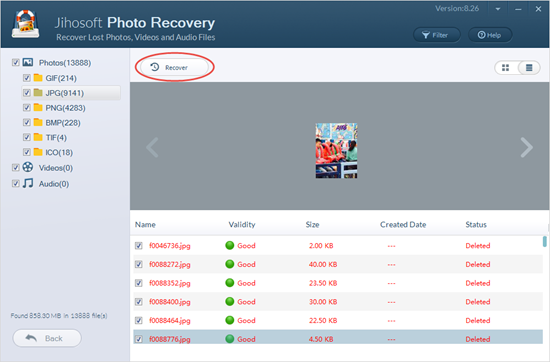 After preview, check those photos you want, click the “Recover” button and select a location to store the recovered photos. After that, the deleted photos will be back. Note: It is suggested that do not directly recover your deleted photos to the original location where your photos were lost, because the existing data might be overwritten. How to Fix the External Hard Drive Corrupted Error? System breakdown is a main factor that causes accidental photo loss. In this case, you will have to fix the crash error first, before you can recover the lost pictures. Don’t worry. The Windows CMD function could fix a corrupted hard drive without formatting it. Connect the external hard drive to your computer. 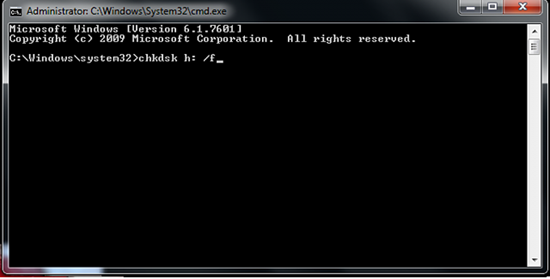 Hold Windows + R, type CMD in the new window and click OK. Then a new CMD command window will be launched. In the window, enter chkdsk /X /f hard drive letter: or chkdsk hard drive letter: /f. Next, Windows will fix the problem automatically and you will be promoted with “Windows has made corrections to the file system“ if this method works.